Titan N2 Nitrogen Generation systems have been installed in facilities worldwide and have been specifically designed to be suitable in a wide range of industrial and laboratory environments. Our line of generators allows you to produce nitrogen gas on-site simply, safely and cost effectively. We can provide you with a reliable source of nitrogen gas generated on demand by a fully automatic nitrogen generator, delivering high purity nitrogen. 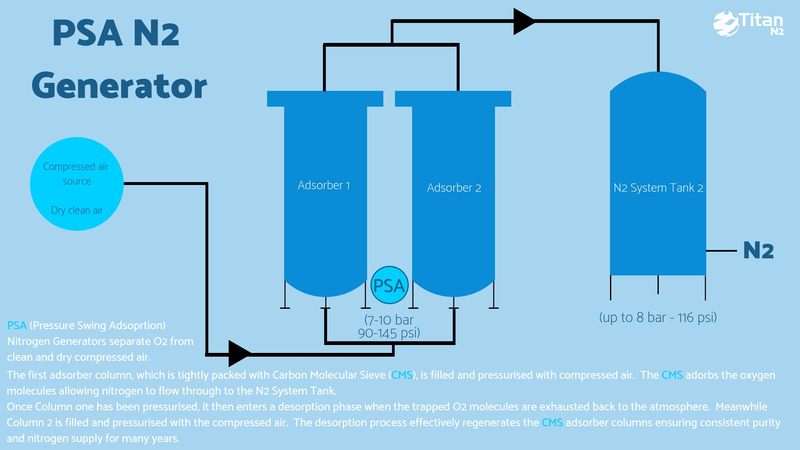 All of our nitrogen generators work using Pressure Swing Adsorption Technology (PSA) to remove O2 from compressed air. Using our cross industry experience and knowledge we can design, deliver and integrate a bespoke industrial nitrogen generator to meet your specific needs. Whatever your industry or application, we will work with you to create a solution with a long-term future of convenience and major cost savings. Our nitrogen generation systems deliver low operating costs and rapid return on investment. Our nitrogen gas generators are small, quiet and offer instant access to newly produced gas. Their designs are industry specific, offering consistent quality and flexibility to facilities of all sizes. They cater to a variety of applications from evaporating solvents and switching valves to purging chambers and more. For information on our Nitrogen Generators get in touch with the Titan N2 team today.